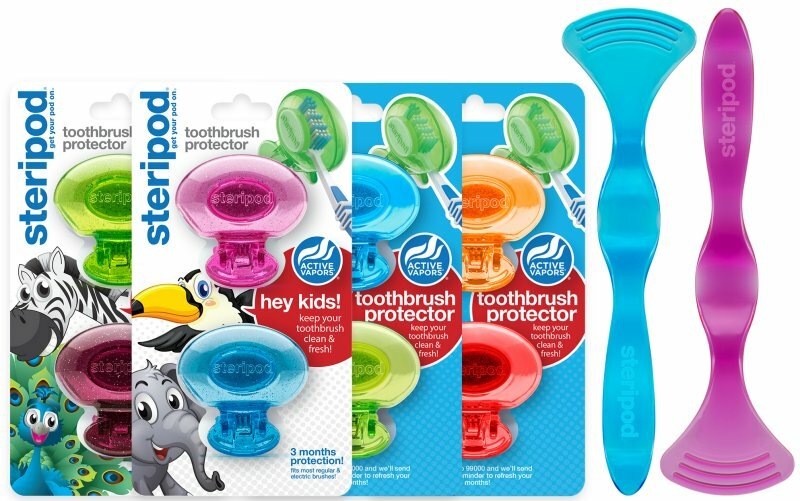 February is National Children’s Dental Health Month and to celebrate, Steripod – makers of the top-selling toothbrush protectors in the US, recommended by leading dentists and orthodontists – is offering two free Tongue Cleaners with every NCDHM Kit purchased through March 31. The vast majority of bad breath – 90% – starts with a dirty tongue. Steripod Tongue Cleaners fight bad breath by gently scraping away build up. The small head reduces gag reflex, making fresh breath that much easier. Each kit contains 4 Steripod Toothbrush Protectors in Pacific Blue, Envy Green, Tangerine Dream and Volcano Red; 4 Steripod Kids Glitter Toothbrush Protectors with fun animal-themed packaging in Princess Pink, Brilliant Blue, Pretty Plum and Dazzling Green; and 2 Steripod Tongue Cleaners in Pink and Blue. Click here to shop the limited-edition NCDHM Kit for $19, which qualifies for free shipping in the USA, and is a total savings of nearly $12.